Hospitality requires a certain order and discipline. Guests feel more at ease the more we do our work of hospitality in predictable and just ways. There is no need to hustle for favors, to compete telling stories of woe, or to try to ingratiate oneself with those of us who are serving. Our boundaries are clear. We serve coffee from 8am to 11:15a.m., and then we make a “last call for coffee.” Guests can have as much coffee (with as much sugar and creamer) as they want until 11:15, then we are done. Unlike the showers, it is not the physical limitations of our house that led us to the number of men and women who can sign up for “socks and hygiene.” In fact the number who can sign up, “fifty-one,” is intended to make a point about the boundaries we have as we offer hospitality. But how many could we serve each day in a way that was hospitable? Fifty seemed about right given how many we had been serving, the amount of time we were open, and our resources. Fifty seemed a reasonable boundary for “socks and hygiene” just like twenty-five men and fifteen women seemed to be reasonable boundaries for showers, and 11:15a.m. seemed to be a reasonable boundary for coffee serving. 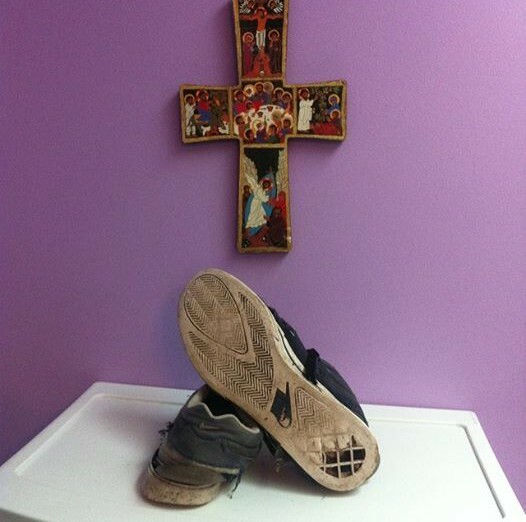 But as we were making this decision about this “socks and hygiene” boundary, our morning prayer presented us with this biblical verse, “For judgment will be without mercy to anyone who has shown no mercy; mercy triumphs over judgment” (James 2:13). How to remind ourselves that the number fifty (like all the rest) was not to be set in stone, not to be an unrelenting judgment, but rather to be grounded in the graciousness of mercy? Kathleen had the idea, “How about we take fifty-one names instead of fifty?” And ever since then this odd number has continued to remind us to “transcend the rules” when our boundaries would hurt rather than help hospitality. So some days, more than twenty-five men, or more than fifteen women, take showers. And some days, we even serve more than fifty-one people “socks and hygiene.” And on occasion a guest might get a cup of coffee slightly past 11:15a.m. But most days, the days of “ordinary time,” we serve our guests within the boundaries that help us to do ordinary hospitality. How do we know when to transcend the rules, when to do some “extraordinary” hospitality? There is not a rule for transcending the rules. Rather it comes down to experience and wisdom in hospitality, joined with the humility to accept God’s mercy; a mercy sometimes offered to us in a guest’s request for a pair of socks past fifty-one, or a shower past twenty-five or fifteen, or a cup of coffee past 11:15a.m.